Virginia Beach, VA – John Feigenbaum, President of David Lawrence Rare Coins and Dominion Grading Service, announced today the unveiling of a new web site called Stella (www.stellacoinnews.com) which will provide daily Blogs by numismatic leaders, as well as free access to DLRC Press publications. According to Feigenbaum, "We hope Stella will become a regular stopping point for collectors who are looking for more information on current events within the coin community, as well as reference material that they previously could only find in books. In our first month of operations, we have published two rare books from our catalog. The first was David Lawrence’s anecdotal stories titled, Tales from the Bourse. 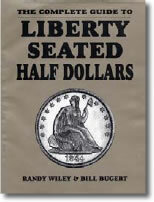 The second, more ambitious effort is The Complete Guide to Liberty Seated Half Dollars by Randy Wiley and Bill Bugert. This amazing book remains the only standard reference to die varieties of this series and it has been largely unavailable for over 5 years. We’ve heard of folks have to pay as much as $200 for a copy. Now you can get all of it…online…FREE. Another major benefit is users can comment on all aspects of the book with updated information, and the authors themselves can augment data over time." Future plans for Stella include as many as 10 more DLRC Press titles and we hope to get other authors to contribute their books as well. As publishers of the Stella site, we encourage as much participation as possible to make this a community forum. Two New Additions to the Stella Coin News Library Available Free!